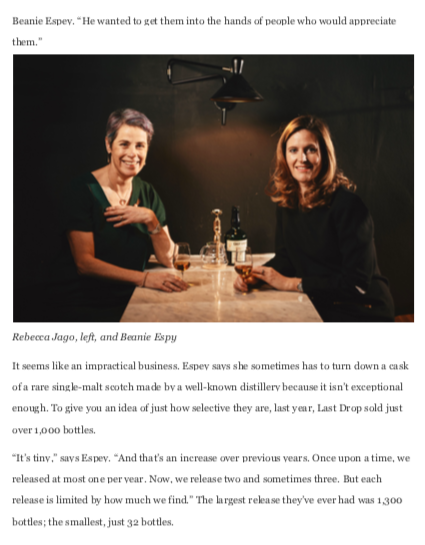 Please see the exert below for a feature on Square Mile (UK) where The Last Drop’s 1925 Cognac has been included in a piece titled ‘The Drink’. The feature notes how ‘it’s not just the floral notes and hints of red and black cherry that make this cognac so prized. No, it’s the story behind the bottle that makes it a one-off (well one of 182 anyway)’. The piece also mentions how this release is ‘a true taste of history, and never to be repeated’. 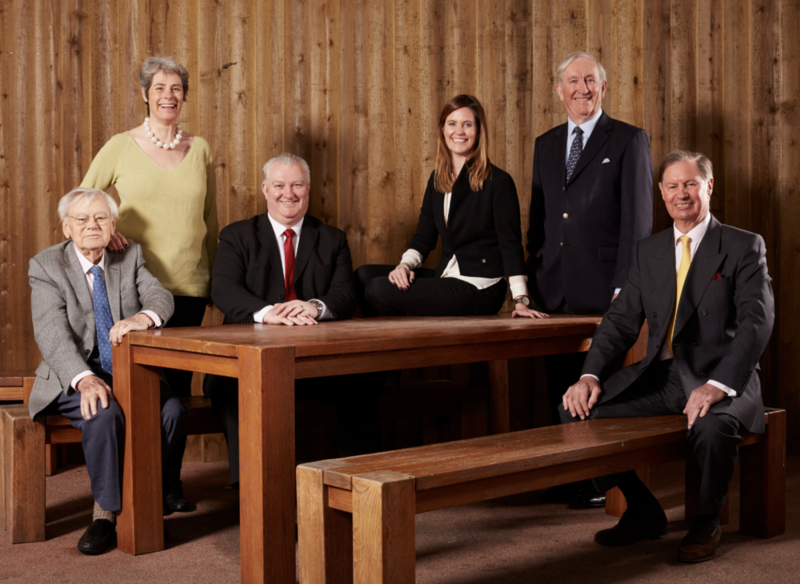 An image and website credit have also been included. 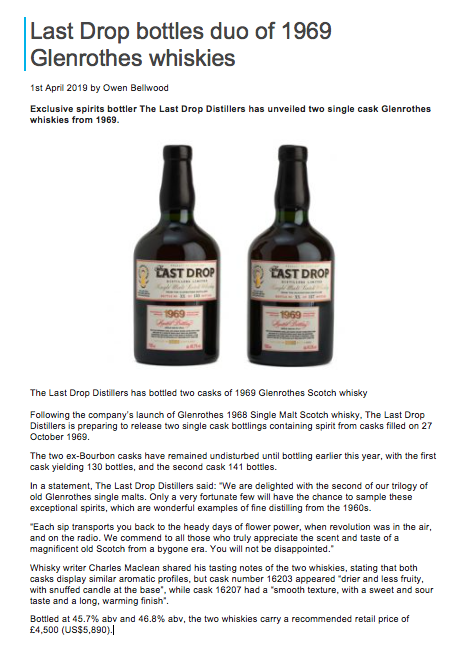 The Last Drop Distillers have featured on The Spirits Business (UK) where our 1925 Cognac has been included in a piece titled ‘Last Drop bottles 1925 Grande Champagne Cognac’. The feature notes how ‘the Cognac was distilled in a small, traditional wood-fired still in the same year that The Great Gatsby was published, work on Mount Rushmore began and the first edition of The New Yorker was released’. An image has also been included. 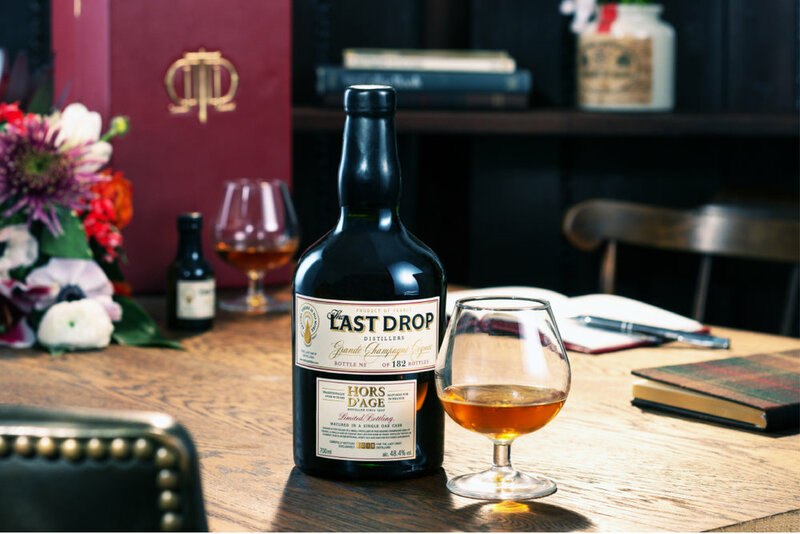 The Last Drop Distillers have featured on The Drinks Business (UK) where James Espey has written a piece titled ‘Baileys Irish Cream: The Real Story’. 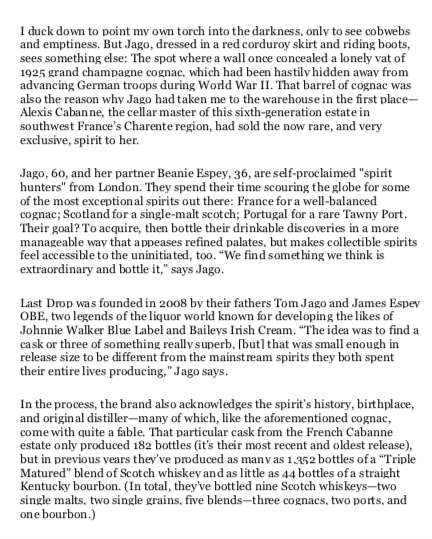 The feature notes how James and Tom ‘developed a wonderful complementary partnership which lasted 41 years, launching a variety of brands, including Le Piat D’Or, Malibu, The Classic Malts, Johnnie Walker Blue Label, Chivas Regal 18 and our final brand – The Last Drop Distillers Limited, which is now run by our daughters’. 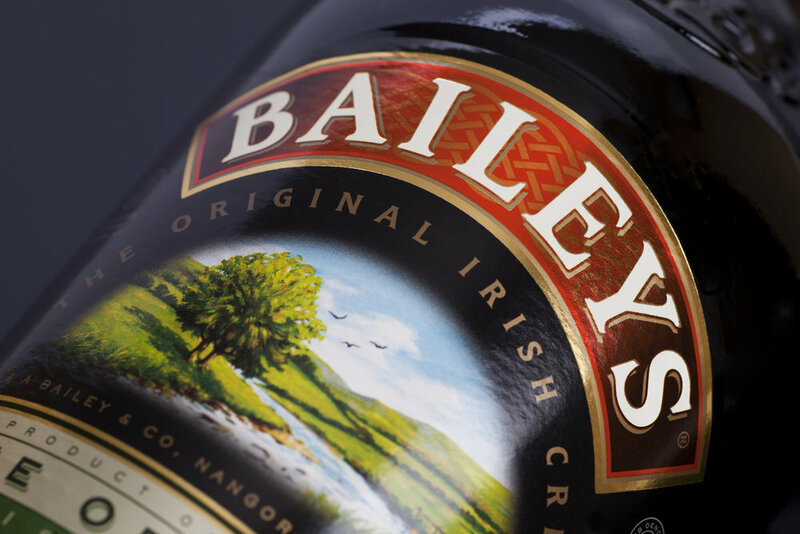 The piece then goes on explain in Tom’s words, the real story behind Baileys Irish Cream. 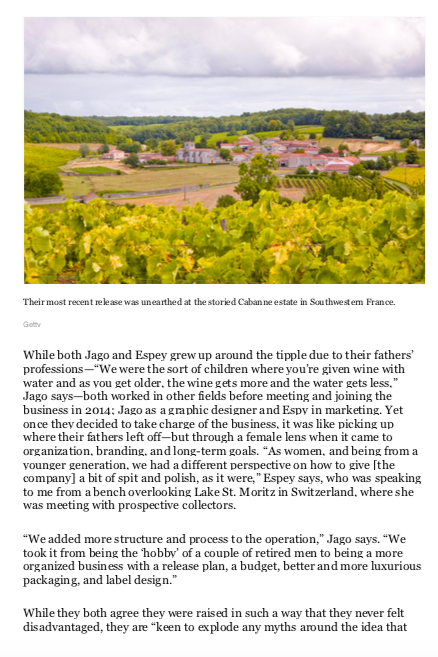 The Last Drop Distillers has featured in The Sunday Times Magazine (UK) where our 1925 Cognac has been included in a feature titled ‘While the cold lingers, look to France to lift the spirits’. The piece notes how ‘The British have been trading these spirits for centuries, but lately two firms have unearthed extremely unusual examples. The Last Drop Distillers has a highly seductive 1925 vintage, discovered behind a wall in a cellar bricked up since 1940’. 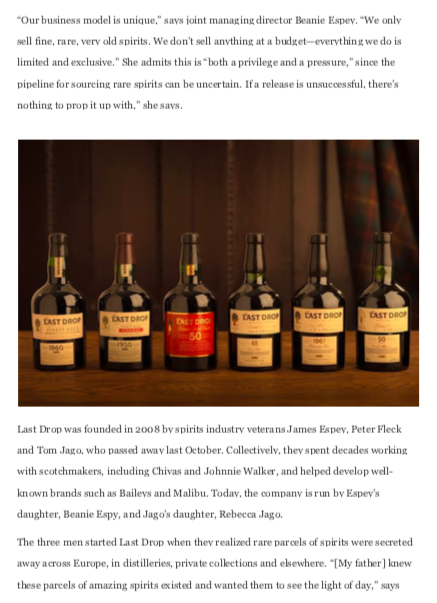 The Last Drop Distillers appear on Airows Online in an article titled “THIS RARE COGNAC DISTILLED IN THE '20S WAS BURIED BEHIND A SECRET WALL FOR NEARLY 80 YEARS” by Jared Paul Stern. 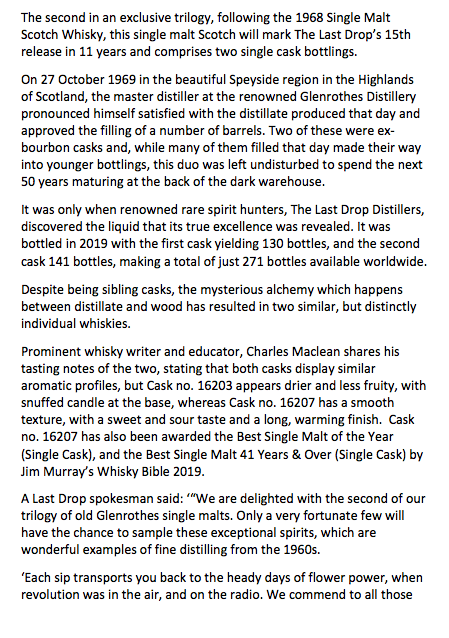 The Last Drop Distillers have featured on The Versatile Gent in a feature titled “THE LAST DROP DISTILLERS HUNT THE WORLD’S RAREST SPIRITS” by James Want.